Well it seems when DC said Wonder Woman would be turning over a new leaf in Wonder Woman #600 it wasn't just hollow marketing speak. 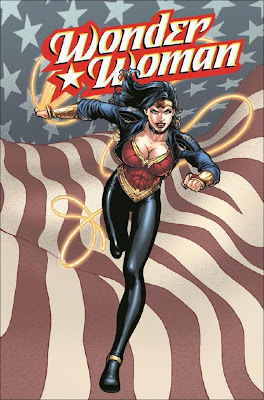 Her entire history has been reshuffled like a rubix cube and her classic costume replaced with what at first looks like what would have resulted if Lynda Carter had ever spun around anti-clockwise. THE PLOT: In the past, the Gods of Myth break from the current timeline, withdrawing their protection of Paradise Island. As the Amazon's fall to dark forces Wonder Woman's mother gives over her three year old daughter to a select group of protectors and spirits them away. 20 years later, Diana raised in the modern world, with only visions of what was, has become the saviour of her people. Fleeing the forces that still seek their destruction, while locating other amazon survivors, avenging the fall of Paradise Island, and piecing together why the Gods abandoned her people. As a fan who has collected Wonder Woman since pre the George Perez days, I actually like the sound of the new 'Wonder-verse'. The mythology is still there, and I'm sure the ideals of the character will be too - just that 'Big 7' JLA might be a little further away than many people think. Even fans of the character knew the book was in trouble and something needed to be done. Sure in look, name and powers she has the same worldwide recognition as Superman, Batman and Aquaman but it wasn't getting her anywhere. Now for better or worse in under 24 hours she has appeared everywhere from The New York Times and ABC, to DC Comics Source blog. People are talking about Wonder Woman. Fans are showing how passionate they are for her in public forums outside of the same old chat-rooms, and it's surprising to see where they are popping up. Positive or negative reaction it is still an amazingly affirmative response, in that it illustrates the importance of a character previous sales and media attention shows people were writing off faster than shares in BP oil. THE LOOK: While I understand that leading an underground movement in a patriotic halter top and solid gold bustier might be a little difficult, I'm not sure this outfit combines the best of both worlds. 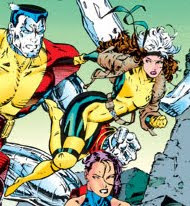 Jim Lee - one of the all time greats - pretty much started the leather-jacket super-hero fad when he re-designed Rouge for Marvel, so it seems odd he would go back when he usually blazes forward. Sure it says 'Street Fighter' but is it 'Wonder Woman' - maybe that was the brief? Maybe that's the point? Still wardrobe changes are never set in stone, and who knows, with a few alterations as the story progresses, it might turn out okay. After all, writer J. Michael Straczynski keeps comparing the 'new' Wonder Woman to Trinity from The Matrix, and she was rarely in the same outfit twice, let alone a fraction of this iconic 69 year old's age.